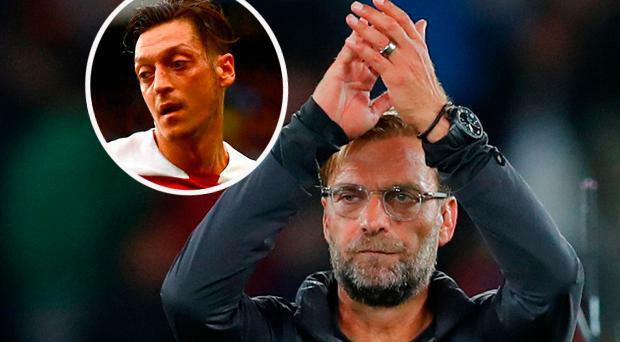 Liverpool manager Jurgen Klopp has defended Mesut Ozil from the “hypocritical” criticism the Arsenal player has received since deciding to retire from the Germany international team. Ozil, 29, announced his international retirement last month after Germany crashed out of the World Cup. He said he had faced “racism and disrespect” because of his Turkish roots. Ozil, who had been a key member of the 2014 World Cup-winning side, had faced a barrage of criticism for having his photograph taken with Turkish President Tayyip Erdogan in May and for his performances at the World Cup in Russia. In a statement, the Arsenal player said he believed he had been turned into “political propaganda” and no longer felt proud playing in a Germany shirt. “I am a German when we win, an immigrant when we lose,” he wrote. And in an interview on Sport 1, Klopp has said the issue has “blown up”, with players such as Ozil and Manchester City midfielder lkay Gundogan coming in for unfair criticism. “This is a classic example of absolute misinformation and, of course, complete nonsense,’” he said. “In politics, little things have always been blown up and big things pushed away in order to continue. Normally, intelligent people tend to hold back because it is not easy to say the right thing. I would count myself [among those people] too. All those who have no idea are very loud in these conversations. “I know Ilkay Gundogan very well, I know Emre Can and Nuri Sahin very well. I do not know Mesut so well, but I would like to take him home. I do not doubt these guys, at least about their loyalty to our homeland. In his resignation statement last month, Ozil accused the German Football Association and its president, Reinhard Grindel, of failing to back him in the row over the photo. Grindel has since acknowledged he should have handled the situation differently. “I should have positioned myself more clearly given the racist attacks from some corners and I should have put myself in front of Mesut Ozil,” he admitted. And Klopp added that he believes cultural diversity in the German international team is something worth fighting for. “Cultural diversity, we all thought it was really cool around the 2006 World Cup. I saw these fantastic commercials where the parents of Gerald Asamoah and Mario Gomez had a barbecue party together,” Klopp said. “We all sighed for how great that works. And now two guys are seduced by politically quite intelligent people to have a photo, and then have relatively few opportunities to say what they want 100 per cent right.